Meet Marcia! 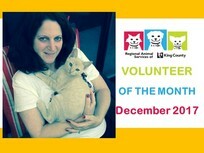 Marcia has been one of RASKC’s most prolific foster volunteers since 2008. For a few years she and volunteer Melissa Edlund sponsored a critter cottage specifically to care for lots of RASKC foster animals. Marcia has led and participated in many special adoption events over the years and almost always seems ready to help out in the most positive ways. Since 2011, Marcia has donated almost 9,000 hours to RASKC. An interview with Marcia can be found on the RASKC website and blog. Thank you, Marcia! RASKC joins the beautiful world of Instagram! You are encouraged to share pictures of RASKC animals. Whenever you do so on Instagram, please take these three steps: (a) Tag RASKC @kingcounty.pets; (b) Write a very brief description of the pet that highlights their best qualities; and (c) Add hashtags, like #RASKC, #kingcountypets, a hashtag unique to the animal (# + pet's name + Kingcountypets + pet's animal idenification number)- for example our Pet of the Week #ClarenceKingcountypetsA547137. Also include a hashtag for the pet's location, like #PetcoCovington or #PetcoKirkland or #PetcoTukwila or #ReberRanch. Another great hashtag is #RASKCvolunteer. Thanks for sharing your beautiful RASKC photos on Instagram! 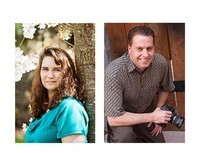 Twyla and David Delpozzi, of Precious Paw Photography, are donating their time and expertise to provide our adoptable pets with amazing pet portraits. The couple, who have a passion for animals, have dedicated themselves to coming once a month to our shelter. Setting up in the dog meet and greet room, the duo who is fully equipped with lights, camera and various backdrops are taking awe-inspiring pictures. As if this weren't enough, these artists have also signed up to take Santa pictures at Kirkland Petco for three Saturdays this month as a fundraiser for RASKC. Check out the DelPozzi's magnificent work on our Facebook page, their Instagram account. 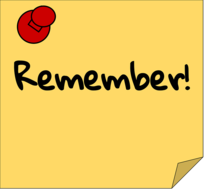 If you would like to make some paper puppets to support our school tours which take place next month, we'd love your help! The instructions are easy. Please leave the backside of the puppets blank. 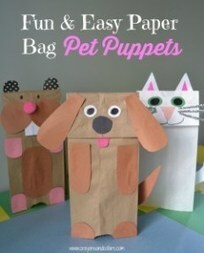 You provide the materials and make the puppets at home. Then drop off your creations any afternoon between Tuesday, Dec 26, and Wednesday, Jan 3 (except not on New Year's Day) either at RASKC/ Kent or RASKC/ Kirkland. In Kirkland we are open until 5:30pm. RASKC/ Kent is open until 5pm on weekends and until 6pm on weekdays. For the second consecutive year RASKC will be hosting special tours that focus on humane education for youth in south King County. Last year kindergartners from Carriage Crest Elementary School in the Kent School District participated. This year RASKC is hosting K-12 students from ACTS Homeschool Group. Gene is responsible for the overall functioning of RASKC, including animal care and adoptions, staffing, equipment, facilities, budgets, relationships with key stakeholders including with the King County Executive, the King County Council, King County’s Administrative Officer, 25 cities that contract with RASKC, and many organizations. Tell us about yourself. Originally from Illinois, now settled on the Eastside of King County. My wife and I have three boys who are in their twenties and who've joined us here. Two study at the University of Washington, and one works for a large media company. Our furry family members include two dogs, Sadie and Stella, and two cats from RASKC, Escobar and Boo. Why did you decide to work to help animals? I have always loved animals. As an undergraduate, I worked as a kennel boy, then as a vet assistant in the neighborhood vet hospital. Then I knew for certain that I wanted to help animals. What did you do prior to coming to RASKC? I worked in a private veterinary practice, also as a shelter medicine veterinarian, as an epidemiologist (scientist that researches illnesses and causes of mortality in human populations), and as Director of Environmental Health (food protection and swimming pool regulation). 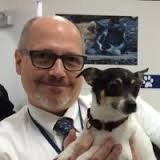 I also served as Executive Director at the City of Chicago’s Commission on Animal Care and Control, also as the President of the Anti-Cruelty Humane Society, and as Chief Executive at a veterinary hospital. What does your work for RASKC involve? I am a connector, using meetings, emails, and phone calls to guide our teams, solve problems with group knowledge, explore new opportunities to help more animals or people, and to keep our partners (contract cities and non-profit organizations) engaged with RASKC. What is the best part about your job? Witnessing the great efforts by all at RASKC to help animals. Each effort, no matter how modest, collectively adds to our capacity to help more animals. Thank you! What do you do when you’re not at work? I work on automobiles. I have an embarrassingly large collection of automotive tools, testers, repair manuals and spare parts. Satisfying and relaxing. Please share a story about an experience with great volunteers. I would rather celebrate what I see routinely at RASKC almost every day (and I thank each of you). I celebrate our Early Morning Cat Crew wrangling colony room cats and adoption cats; I see our dog team hustling dogs out in the early mornings (not clear who is happier, the walker or the “walkee”); I hear our off-site adoption volunteers picking up even more new cats for transport and adoption; I watch our shelter helpers clean, and launder, and clean again; I recognize all the volunteers that help us administrate our huge volunteer program with Sarah; I tear up when a foster mom has to tell us unfortunate news; and I smile hearing our Meet-and-Greet volunteers sharing stories about this fantastic cat with new adopters. These large and small efforts, and many more by each of you, make RASKC a better place each day. Thank you for sharing with the animals and helping us to care for the animals. Your efforts make a difference, every day! Thank you. Many volunteers and staff send fondest farewells to Brenda Dyrdahl, who had worked at RASKC/KCACC for 12 years, seven years as a Shelter Supervisor. Known for her kind, level-headed, low-key approach, Brenda's expertise focused primarily on cats, working with rescue groups, and supervising Animal Care Technicians. She worked Sundays through Wednesdays. 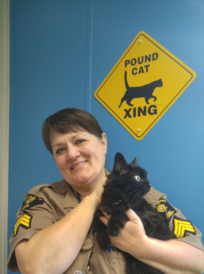 A graduate of the Pierce College Veterinary Technology program, Brenda brought a background of having worked several years as a Licensed Vet Tech prior to becoming a King County employee. Hurray for Allison Wilcox, who is backfilling Brenda's position until it is filled on a permanent basis. Clarence is a 10-year-old German Shepherd mix (ID #A547137). He is an outgoing and carefree dog who can't wait to find his forever home! Clarence is very smart. He knows how to “sit”, “stay” and “come.” When meetings new dogs, Clarence would do best with a slow introduction. Given his shy nature, he would do best in a calm quiet home. 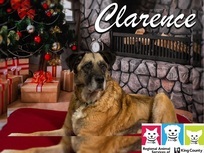 Clarence is microchipped, and his $150 adoption fee also includes a free visit to the veterinarian of your choice, and 30 days of pet insurance through Trupanion. RASKC was featured on Zulily's Facebook Live Broadcast. Last month Zulily employee Jennifer French, who also is a longtime RASKC volunteer hosted our Administrator Lluvia Ellison-Morales and several of our animals in an 18-minute video that was part of Zulily's Facebook live broadcast. 230 cat blankets were made at Lara's volunteer party! Last month over a dozen volunteers made over 230 cat cozy blankets at a party that volunteer Lara Steele hosted in her home in Bellevue. Thanks to Lara and all who participated including Angela and Gwendolyn Beegle, Ki and Jocelyn Cho, Pam Gibbons, Lorelie Helzer, Jennifer Hunt, Emmy Moreno, Tiffany Morin, Ted Myers, Teresa Rosenberg, and Felicia and Vanessa Singh. Volunteers are wrapping gifts at Barnes and Noble this month to raise money for RASKC's Angel Fund. We're at Tukwila/SouthCenter B&N this Thursday (Dec 21) from 2pm- 10pm. Plus we were there on four other dates earlier this holiday season. We'll be wrapping gifts at Barnes and Noble in Federal Way this Wednesday (Dec 20) from 12pm- 8pm, and this Thursday (Dec 21) from 12pm- 8pm. Plus we were there last weekend. Thanks to B&N Lead Volunteer Jini Allen and her crew of 50 volunteers! Update your profile in your online RASKC volunteer record. Do you like arts and crafts? Do you have a background in event planning? RASKC provides an opportunity to identify many interests and skills. Please update your online volunteer record to receive special messages based on your profile. Go to the "My Profile" tab in your online record and fill in the blanks. If you're not sure how to do this, send an email to RASKC. Was your shift short-staffed? If you ever work a shift when there were not enough volunteers, please notify RASKC and your team leaders right away. We want to track whenever this occurs and make every effort to ensure better coverage in the future. If there are gaps in volunteer coverage, in most situations RASKC staff will help out. If you are asked to feed rabbits at RASKC, remember to give only 1/4 cup of pellets per rabbit. Because of this sedentary environment, it's especially important not to overfeed our animals. May all of the holidays that you celebrate be filled with joy! All teams are on their regular schedules for Christmas Eve, Dec 24. Dog Walkers @ RASKC/ Kent only in the morning. Shelter Helper @ RASKC/ Kent only in the morning. Note: RASKC closes to volunteers at 12pm on Christmas. Our Petco stores and Reber Ranch are closed Dec 25. Petcos in Covington and Tukwila if there are any cats or any "hard cleans"
RASKC closes to volunteers at 4pm on Jan 1. For any questions or comments or suggested topics for future eNews, please contact us.